Located Highway 61 and Sunbeam Blvd. 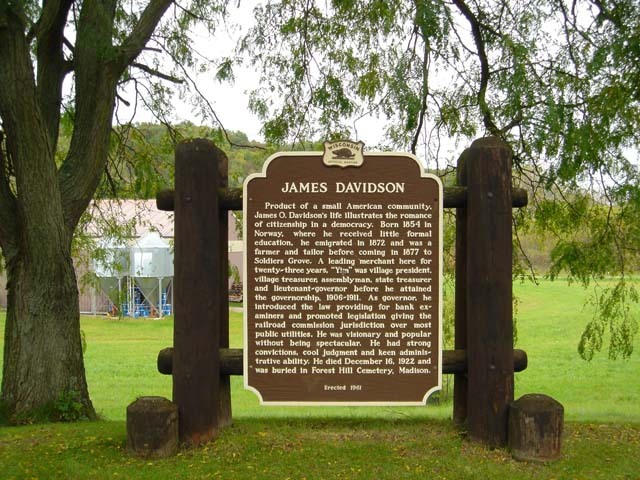 Soldiers Grove, WI Coordinates Lat N 43:23':150" Lon W 90:45':771"
Product of a small American community, James O. Davidson's life Illustrates the romance of citizenship In a democracy. Born 1854 In Norway, where he received little formal education, he emigrated in 1872 and was a farmer and tailor before coming in 1877 to Soldiers Grove. A leading 'merchant here for twenty-three years, "Yim " was village president, village treasurer, assemblyman, state treasurer and lieutenant-governor before he attained the governorship, 1906-1911. As governor, he introduced the law providing for bank examiners and promoted legislation giving the railroad commission jurisdiction over most public utilities. He was visionary and popular without being spectacular. He had strong convictions, cool judgment and keen administrative ability. He died December 16, 1922 and was buried in Forest Hill Cemetery, Madison.